This article is about the region on Long Island. For the incorporated village within the region, see Great Neck (village), New York. Great Neck is a region on Long Island, New York, that covers a peninsula on the North Shore and includes 9 villages, such as the villages of Great Neck, Great Neck Estates, Great Neck Plaza, and Russell Gardens, and a number of unincorporated areas, as well as an area south of the peninsula near Lake Success and the border territory of Queens. 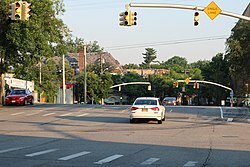 The incorporated village of Great Neck had a population of 9,989 at the 2010 census, while the larger Great Neck area comprises a residential community of some 40,000 people in nine villages and hamlets in the town of North Hempstead, of which Great Neck is the northwestern quadrant. Great Neck has five ZIP Codes (11020–11024), which are united by a park district and one school district. The hamlets are census-designated places that consolidate various unincorporated areas. They are statistical entities and are not recognized locally. However, there are locally recognized neighborhoods within the hamlet areas, such as Harbor Hills, Saddle Rock Estates, University Gardens, and Manhasset. The Manhasset neighborhood (in ZIP Code 11030) is not considered part of Great Neck. The part of the Hamlet of Manhasset that is considered part of Great Neck includes the Great Neck Manor neighborhood. Great Neck Gardens is featured on many maps as a name of one such hamlet, even as the name is used rarely if ever by local residents. As of the census of 2010, there were 9,989 people, 3,645 households, and 2,620 families residing in the village. The population density was 7,062.3 people per square mile (2,727.9/km2). There were 3,645 housing units at an average density of 2,547.9 per square mile (984.1/km2). The racial makeup of the village was 82.8% White, 2.0% African American, 0.20% Native American, 7.2% Asian, 0% Pacific Islander, 3.9% from other races, and 3.9% from two or more races. Hispanic or Latino of any race were 10.2% of the population. As of 2000 Great Neck was the second-most ethnic Persian populated place in the United States, with 21.1% of its population reporting Persian ancestry. The general trend has been that the northern part of Great Neck (north of the LIRR tracks) has a greater number of Persian families, while the southern part (south of the LIRR tracks) has a larger East Asian population. The African American population is low in all of Great Neck. There were 3,346 households, out of which 36.6% had children under the age of 18 living with them, 63.9% were married couples living together, 8.8% had a female householder with no husband present, and 23.7% were non-families. Of all households, 20.9% were made up of individuals and 12.2% had someone living alone who was 65 years of age or older. The average household size was 2.85, and the average family size was 3.30. In the village the population was spread out with 26.4% under the age of 18, 6.0% from 18 to 24, 25.3% from 25 to 44, 24.7% from 45 to 64, and 17.5% who were 65 years of age or older. The median age was 40 years. For every 100 females, there were 94.2 males. For every 100 females age 18 and over, there were 90.0 males. The westernmost portion of the Hamlet of Manhasset lies between the villages of Thomaston and Lake Success and has Great Neck postal codes (1102x). Before the Dutch and English settlers arrived on the peninsula of Great Neck in the 17th century, the Mattinecock Native Americans originally inhabited the shorelines of the peninsula. It was not until 1681 when the European settlers held the first town meeting. The Mattinecock or Metoac used Long Island Sound as a way to both fish and trade with others. They referred to present-day Great Neck as Menhaden-Ock. It is speculated that they chose this name because of the large amount of fish in the area. With the arrival of the European settlers on the peninsula in the 1640s, Menhaden-Ock evolved into Madnan's Neck. By 1670, Madnan's Neck had further evolved into the current name Great Neck. Local legend has it that the name "Madnan's Neck" is named after Anne (or Nan) Hutchinson. It is said that Anne Hutchinson tried to take over what is considered present-day Kings Point upon her arrival to the peninsula. However, Anne Hutchinson could not actually procure a land grant or deed for the land that she desired. Her temper supposedly earned her the nickname Mad Nan. On November 18, 1643, the Hempstead Plains, which included the peninsula of Great Neck, was sold to the Reverend Robert Fordham and John Carman. In the beginning, the Mattinecock Indians and the European settlers cooperated and coexisted very well together. The Mattinecock would teach the settlers their knowledge of the land in exchange for new technology from the settlers. The settlers even started using the Indian currency of wampum. However, this peaceful coexistence would not last forever, and the relationship between the Mattinecock and the settlers quickly began to deteriorate. Settlers often began complaining of unfriendly Mattinecock behavior, claiming that the natives would damage their homes and hurt their cattle. On November 18, 1659, the settlers passed a law that forced the natives to pay damages for white property that they had damaged. The problem between the settlers and the Mattinecock natives over land and property kept growing and finally came to a head in 1684. A commission of settlers had been elected and given the power to appease the Mattinecock and their leader Tackapousha. Tackapousha was eventually paid off, and received 120 pounds sterling for his land. Tackapousha eventually died, and his body still rests at the Lakeville AME Zion Church's cemetery on Community Drive, across the street from North Shore University Hospital. The Lakeville AME Zion Church is one of the oldest churches in New York State. The very first European to look upon the Long Island peninsula of Great Neck was Captain Adrian Block of the Great Dutch West India Company in 1614, when his men were stranded on the southern tip of Manhattan Island, because their ship Tiger sank shortly after its landing. The captain and his men then built a ship called the Onrust out of timber and salvaged parts from Tiger. When the sailors set sail again, they sailed around Long Island, mapping it as they passed. Later, the Reverend Robert Fordham and John Carman first came to Great Neck from New Haven by use of Long Island Sound. During this trip, the deal with Chief Tackapousha was reached. One year later, on November 16 William Kieft granted a special land patent for the territory, and permission for the community's incorporation. William Kieft was the director general of New Netherland, and the patent that he granted gave the people of the peninsula the right to religious self-determination. The new community's political independence was so great that only town officials who were in any way elected by the Dutch government or its magistrates, first nominated by a town meeting. The Dutch controlled Long Island from 1642 to 1664. Under Dutch rule, constables, local officers, nominated magistrates, and overseers were elected by town meetings and passed legislation. On December 21, 1656, Peter Stuyvesant, who was the director general of New Netherland after William Kieft, appointed the first two magistrates of Hempstead. These two men were John Seaman and Richard Guildersleeve. The local government of Madnan's Neck at the time was extremely active in passing new laws. A liquor tax was imposed, and half of that tax paid for the town's supply of ammunition, with the other half going to education. A religious code of ethics was also published by the local government, which included conduct on holidays for the entire town. There were also punishments for poor conduct, which included fines, corporal punishment, and banishment. The first reported instance of sexual misconduct in the peninsula's history was recorded on October 3, 1659, against Henry Linnington. After the threat of being banished, Linnington was ultimately allowed to stay, on the condition that he reformed his behavior. Around this time, the boundaries of Madnan's Neck and Hempstead grew increasingly apart. As the population of Madnan's Neck grew, independence from Hempstead became increasingly realistic. In 1672, Robert Jackson, a well-known man in the community of Madnan's Neck, beat out Simon Seryon in the election for constable of Hempstead by a count of 39 to 31. However, Seryon was still declared the victor, due to governmental corruption and back door bribery. Incensed by the fixed election and obviously staged result, residents of Madnan's Neck petitioned the governor for separation, but their request was denied. Finally, on June 9, 1687, the order went out from the government of the New Netherland that Madnan's Neck be "separate, hereafter from Hempstead". The town was then given its own marshal, and its own constable. The first constable of Madnan's Neck was a man named Edward Hare, who helped aid in the movement for Madnan's Neck's independence. Over time Madnan's Neck grew increasingly politically independent over time. Throughout the next few years, Madnan's Neck depended even less on Hempstead. Few communities of Madnan's Neck's size had their own highway, grist mill, minister, constable, and marshal, yet Madnan's Neck, emerged from Hempstead as a fully functioning town. During the late 19th century, Great Neck was the rail head of the New York and Flushing Railroad, and began the process of converting from a farm village into a commuter town. In the 1920s, Great Neck—in particular the Village of Kings Point—provided a backdrop to F. Scott Fitzgerald's book The Great Gatsby. It was thinly disguised as "West Egg," in counterpoint to Manor Haven/Sands Point, which was the inspiration for the more posh "East Egg" (the next peninsula over on Long Island Sound), Great Neck symbolized the decadence of the Roaring Twenties as it extended out from New York City to then-remote suburbs. The Great Gatsby's themes and characters reflected the real-world transformation that Great Neck was experiencing at the time, as show-business personalities like Eddie Cantor, Sid Caesar, and the Marx Brothers bought homes in the hamlet and eventually established it as a haven for Jews, formerly of Brooklyn and the Bronx. In 1943, the United States Merchant Marine Academy was founded at the former location of Walter P. Chrysler's palatial estate in Kings Point, as the only higher education institution in Great Neck. The end of World War II saw a tremendous[clarification needed] migration of Ashkenazi Jews from the cramped quarters to the burgeoning suburb. They founded many synagogues and community groups and pushed for stringent[clarification needed] educational policies in the town's public schools; it is portrayed in Jay Cantor's 2003 novel Great Neck, with recently installed residents of all stripes trying to secure the brightest futures for their children. During the construction of the current headquarters of the United Nations from 1947 through 1952, the United Nations was temporarily headquartered at the Sperry Corporation facility in the Great Neck community of Lake Success due to its proximity to Manhattan. Eleanor Roosevelt headed the UN Commission on Human Rights at this location. During the 1960s, many residents frequented the local pool and ice-skating complex, Parkwood, after which its patronage dramatically increased following years of decline as homeowners built their own in-ground pools. After the September 11 attacks, the ice-skating rink was renamed in honor of Andrew Stergiopoulos, a local resident who was killed in the attack. It was extensively renovated in 2007 and 2008. Great Neck is a 25- to 35-minute commute from Manhattan's Penn Station on the Port Washington Branch of the Long Island Rail Road via the Great Neck station, which is one of the most frequently served in the entire system; as a result, many LIRR trains terminate at the station to serve the large number of riders. Nassau Inter-County Express connects the villages to the train station and offers service to several destinations in Nassau County and Queens from the station, while the southern part of the Great Neck area can also directly access the Q46 New York City Bus on Union Turnpike at the border with Glen Oaks and the Q12 bus on Northern Boulevard at the border with Little Neck. The Village of Great Neck is protected by the Nassau County Police Department's Third Precinct, as is the rest of Great Neck except for the villages of Great Neck Estates, Kings Point, Kensington and Lake Success. Those villages have their own police departments, which are reinforced by the NCPD during any criminal activity, event, or other incident that falls outside the realm of "routine." Great Neck is served by three all-volunteer fire departments. The Great Neck Alert Fire Company was founded in 1901. The Great Neck Vigilant Fire Company was founded in 1904. Company 3 of the Manhasset-Lakeville Fire Department was founded in 1912, and Company 4 of the M-LFD was founded in 1926. Alert covers the northern part of the peninsula, including the Village of Great Neck, providing fire and heavy rescue response. Alert responds to certain medical emergencies with its heavy rescue truck and provides care before the arrival of an ambulance. Vigilant serves the middle portion of Great Neck with fire and heavy rescue response. The Vigilant Fire Company also provides emergency ambulance services to both its own territory and Alert's. M-LFD Co. 3 and 4 serve the southern part of Great Neck, including the villages of Thomaston and Lake Success. These two companies offer fire and rescue services. The M-LFD Ambulance Unit operates two ambulances out of Co. 3's firehouse. In addition, the Nassau County Police Emergency Ambulance Bureau also provides EMS service to the Manhasset-Lakeville fire district. The Parkwood pool and skating rink complex, the Village Green and sections of Kings Point Park are managed by the Great Neck Park District. The park district serves all of Great Neck except the villages of Saddle Rock, Great Neck Estates, and Lake Success, and the neighborhoods (not hamlets) of Harbor Hills and University Gardens. The areas not served by the Great Neck Park District each have their own facilities for their residents, run by the villages or civic associations. Parkwood can also provide tennis lessons and skating lessons. During the summer it is a part of the Great Neck day camp program, where young campers use the swimming pool facilities. At one time Servisair had its Americas offices in Great Neck. Great Neck is also one of the most affluent towns in the country. Saddle Rock Grist Mill, a historical grain-mill powered by tides; known to have been in operation as early as the 18th century. Steppingstone Park, formerly part of the Walter P. Chrysler estate in Kings Point. Offers summer concerts every Saturday night. Great Neck Plaza Promenade Nights – Several summer nights in Great Neck's downtown area, the streets are closed off and local restaurants bring all of their seating outdoors for a festival evening of dining, live music, and entertainment. F. Scott Fitzgerald's House, which was loosely referred to in his novel, The Great Gatsby. "West Egg" referred to King's Point, a prosperous neighborhood in the North of Great Neck, once known for its prevalence of "new money." 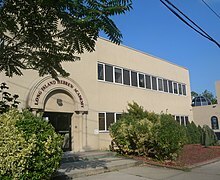 Great Neck Library is the public library system serving the community of Great Neck. There are four branches, located throughout the Great Neck peninsula: Main, Station, Parkville, and Lakeville. The Great Neck Union Free School District is the school district of most of Great Neck. It also includes parts of unincorporated New Hyde Park and Manhasset Hills. A small part of eastern Great Neck around Northern Boulevard is part of the Manhasset Union Free School District, whose students attend Manhasset High School. About 6,200 students, grades K-12, attend the Great Neck Public Schools. There are three high schools: North, South, and Village (a small alternative high school). There is a district-wide alternative high school program, SEAL Academy (Supportive Environment for All Learners). There are also two middle schools and four elementary schools. Students have diverse backgrounds; they come from more than 40 countries and represent a broad socioeconomic range. Great Neck's two major high schools are rated among the top in the country. Its students have been frequent finalists in the Intel Science Talent Search, and Great Neck has produced several Intel STS winners since 1999. In addition, the district has produced several high school winners of the international First Step to the Nobel Prize in Physics, awarded in Poland. In the 2008 Newsweek magazine's annual list of the top 1,300 American high schools, Great Neck South was ranked 49th, and Great Neck North was ranked 68th. Private schools in the region include North Shore Hebrew Academy and Silverstein Hebrew Academy. At one time,[when?] the Japanese Weekend School of New York (ニューヨーク補習授業校) conducted lessons in Great Neck. David Baltimore (born 1938), Nobel Prize-winning biologist and former president of Caltech (former resident and high school graduate). Nikki Blonsky (born 1988), actress who starred as Tracy Turnblad in the 2007 version of Hairspray and in Harold, filmed in Great Neck North High School and Middle School. Mary L. Cleave (born 1947), space shuttle astronaut. Will Durant (1885-1981), historian. Author of the multi-volume outline of world history The Story of Civilization. F. Scott Fitzgerald, author (former resident), lived in Great Neck in the 1920s, at 6 Gateway Drive in Great Neck Estates. He lived here in a modest house not dissimilar to that of Nick, the protagonist of his novel, The Great Gatsby. 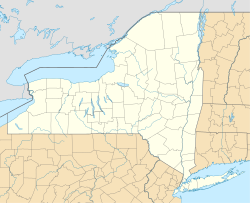 It is said that Fitzgerald modeled West Egg—the fictional town in which Nick lives—after his own Great Neck (specifically Kings Point) and the atmosphere and lifestyle there; and he modeled East Egg after Great Neck's eastern neighbor, Port Washington, or, more specifically, Sands Point. It is possible to see the actual green light referred to in the book, at Stepping Stone Park. The park is located at the top of the Great Neck Peninsula. Ted Nierenberg (1923–2009), founder of Dansk International Designs, created in the garage of his Great Neck home. Sim Van der Ryn, architect, researcher and educator, who has applied principles of physical and social ecology to architecture and environmental design. Sam Warner (1887–1927), one of four brothers who were co-founders of Warner Bros.
Mordecai Waxman (1917–2002), prominent rabbi in the Conservative movement and of Temple Israel of Great Neck. .Max Weber (1881-1961) One of the first American Cubist painters. P. G. Wodehouse (1881–1975), English comic writer (former resident). ^ "Race, Hispanic or Latino, Age, and Housing Occupancy: 2010 Census Redistricting Data (Public Law 94-171) Summary File (QT-PL), Great Neck village, New York". U.S. Census Bureau, American FactFinder 2. Archived from the original on September 11, 2013. Retrieved October 3, 2011. ^ "Community Facts U.S. Census". United States Government. Archived from the original on December 10, 2014. Retrieved July 3, 2013. ^ "Iranian ancestry by city". ePodunk. Retrieved January 20, 2011. ^ "USMMA Mariners – Academy History". Usmmasports.com. Archived from the original on November 1, 2010. Retrieved January 20, 2011. ^ "LIRR Great Neck Timetable" (PDF). Retrieved July 24, 2012. ^ John Campbell. "University Gardens Property Owners Association". Ugpoa.org. Retrieved January 20, 2011. ^ "Contact Details." Penauille Servisair. Retrieved on 13 September 2011. "Americas Penauille Servisair 111 Great Neck Road Suite 600 P O Box 355 Great Neck NY 11022-0355 U S A"
^ Class profile. Retrieved November 9, 2006. ^ "America's Top Public High Schools 2008". Newsweek. May 17, 2008. Archived from the original on September 5, 2012. Retrieved September 13, 2009. ^ DeWan, George. "Learning How To Stay Japanese In America." Newsday. January 6, 1990. PART 11, Start page NOPGCIT. "When the regular school week ends, Yuko Ota attends the Japanese Weekend School in Great Neck - a reminder that, despite the American habits she's learning, she's still Japanese"
^ Miller, David Ian. "Finding My Religion: Dan Ahdoot, Jewish Iranian American comic, on holidays and life in America", San Francisco Chronicle, December 11, 2006. Accessed November 12, 2008. "I grew up in Great Neck, N.Y., which is actually a hotbed of Iranian Jewry, so I didn't really know that I was very different until I went to college." ^ a b Kerr, Kathleen. "They Began Here: Around the country, leading thinkers in health and science can trace their roots to Long Island" Archived 2008-06-09 at the Wayback Machine, Newsday, July 16, 2008. Retrieved September 17, 2008. ^ Amodio, Joseph V. "Great Neck's Nikki Blonsky makes nightclub debut", Newsday, September 23, 2008. Retrieved November 12, 2008. ^ "At home in Great Neck, New York, where the Durants lived from 1928 to 1943, Ariel helped Will and his other aides arrange into chapters and topics the approximately thirty thousand data slips he gathered for each volume of the history. ^ Fox, Margalit. "Theodore Nierenberg, Founder of Dansk, Dies at 86", The New York Times, August 3, 2009. Retrieved August 4, 2009. ^ "Roy G. Niederhoffer". Businessweek.com. Retrieved May 29, 2015. ^ Sim Van der Ryn (Architect), Pacific Coast Architecture Database. Accessed November 28, 2017. "Van der Ryn left Holland during World War II, living first in the Kew Gardens neighborhood of Queens, NY, and then moved to Great Neck, NY, also on Long Island." ^ Goldman, Ari L. "Mordecai Waxman, Rabbi Who Chided Pope, Dies at 85", The New York Times, August 15, 2002. Retrieved November 12, 2008. ^ Guzman, Rafer (June 5, 2014). "'The Fault in Our Stars' writer returns to Long Island". Newsday. Retrieved August 8, 2014. ^ Wodehouse, P.G.. "Dogs and Cats and Wodehouse; Dogs, Cats and Wodehouse", The New York Times, October 3, 1971. Accessed August 5, 2009. "When I was married 57 years ago, I lived in Bellport. Then I moved to Great Neck."